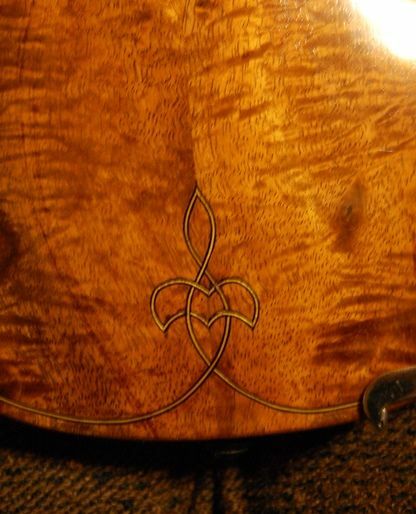 Color coat, front; emulating the wear patterns on the original 1715 “Titian” Stradivarius violin. Color coat, back. Sorry for the poor quality photo…I used the zoom on my phone. Bad choice. 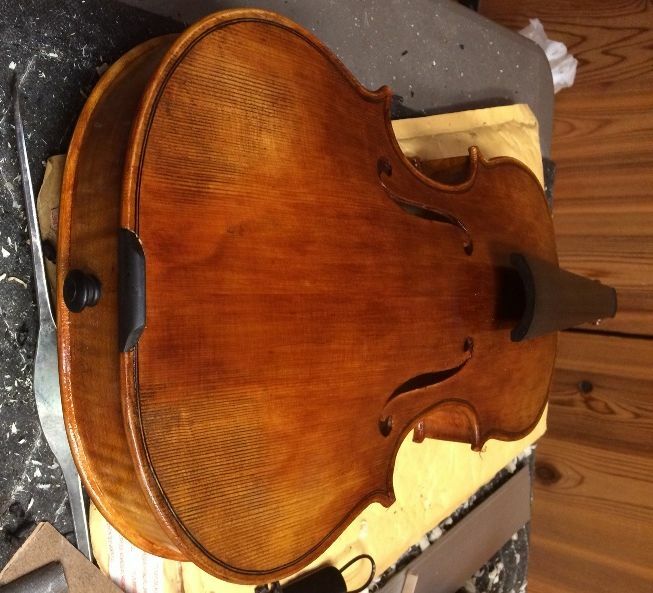 After that coat was good and dry, I continued to build the color in the areas that needed more, and trying to leave it appropriately light in the areas where the Old Master instrument had the most severe wear. I also noticed that there was a “bump”–a ridge in the spruce, near the purfling, which I had not been able to see in the clean, fresh wood, but which, under a reflective layer, became quite apparent. (Sigh...) So, I used a sharp scraper to bring the ridge down flat, and then began rebuilding the varnish layers to match the rest of the area. Corrective “surgery”…removed a ridge in the spruce that I had missed earlier. Rebuilding the varnish, now. And, today, I installed the soundpost, and then applied two coats of clear varnish. Afterward, I installed the end-pin, the tuning pegs, and the fingerboard. Here it is with the clamps still in place. End-pin, fingerboard and pegs installed; pegs still need to be trimmed to length. Endpin couldn’t be seem in the previous photo…here it is. 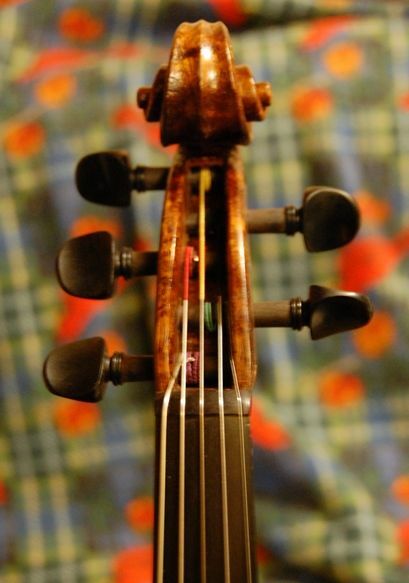 Violin front, prior to set-up. 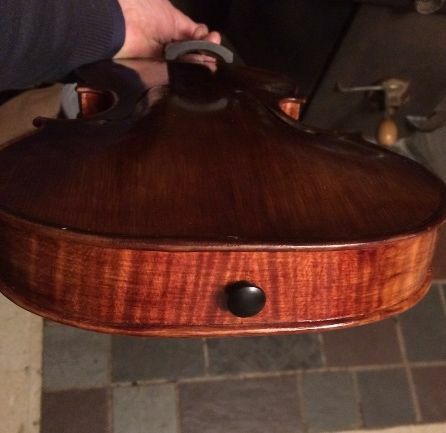 Violin back, prior to set-up. So: That’s as far as I got, today. Next time; the saddle, the nut and final set-up. 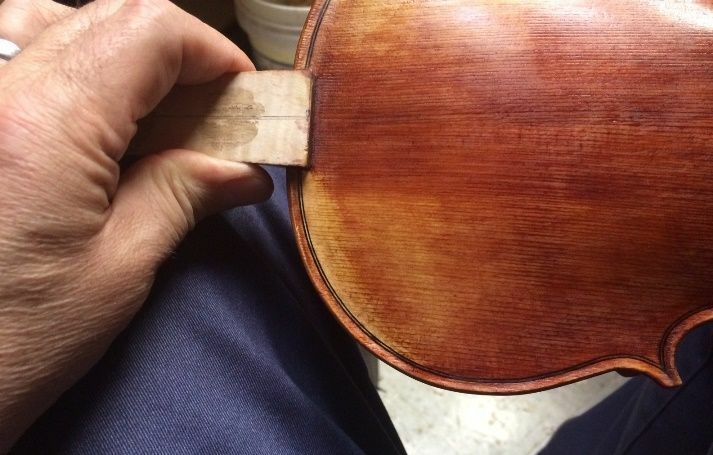 This violin is nearly completed! 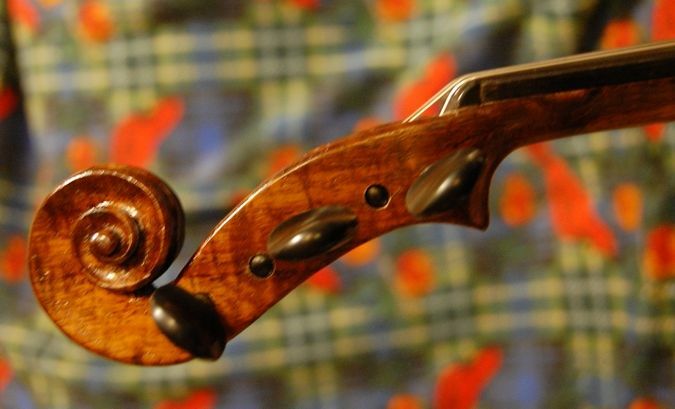 The varnish was about as good as it was going to get, for the moment, so I began asssembling the violin: I re-installed the fingerboard and added the nut, then allowed it to dry. I drilled and reamed a hole in the center of the tail block, and installed the end-pin, then cut the saddle and installed it. In this photo it had just been glued in place. Later I decided to remove the saddle and re-install it. I did a better job the second try. (It had been just a little crooked the first time.) I make a radius on each end of the “footprint” of my saddles, to minimize the chance of saddle cracks. The round-cornered mortise makes for much lower stress to the wood at that point. Although it is not visible in this photo, I also had installed the soundpost. I shaped, fitted and installed the tuning pegs, and had intended to complete the violin that evening, but there were a lot of interruptions, so that was really all I accomplished that evening. Finally, I cut the bridge, and fitted it to the belly of the violin, then adjusted the tailgut for the position of the bridge. (I try to position the tailpice so that, from the tailpiece “fret” to the bridge is 1/6th the distance from the bridge to the nut.) I drilled the string holes in all four pegs, and began installing the strings. As it usually happens, my initial bridge cut was too high, so I removed it and cut it lower, then set the violin up to play it. I went ahead and installed the chinrest, while I was at it. 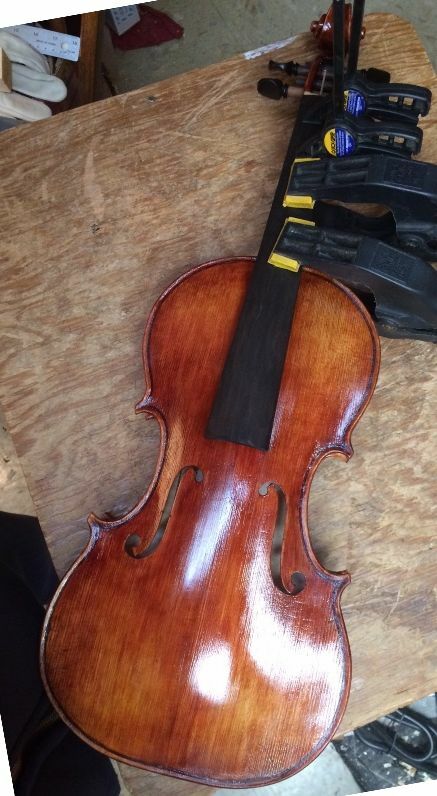 Completed violin. Only varnish re-touch and sound adjustment remain. 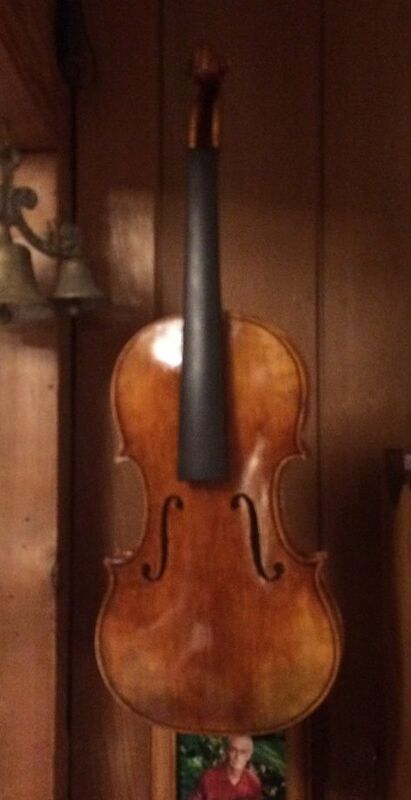 Side view of completed violin. 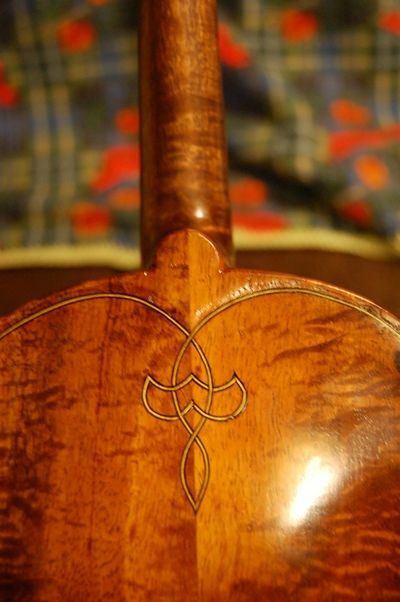 Back view of completed violin. Now the violin is hanging up in the dining room, where it will live while I am completing all the final touch-up for looks and sound. Completed violin awaiting final touches. 5 String Progress Report #17: Finally done! Five String Progress Report #17: Finally finished, Set-up and Playing! I got cranking on the task again, and did not take photos until the job was done. The photos are at the bottom of the post, so if you want to skip all the narrative, you can scroll to the bottom, and just look at the fiddle. 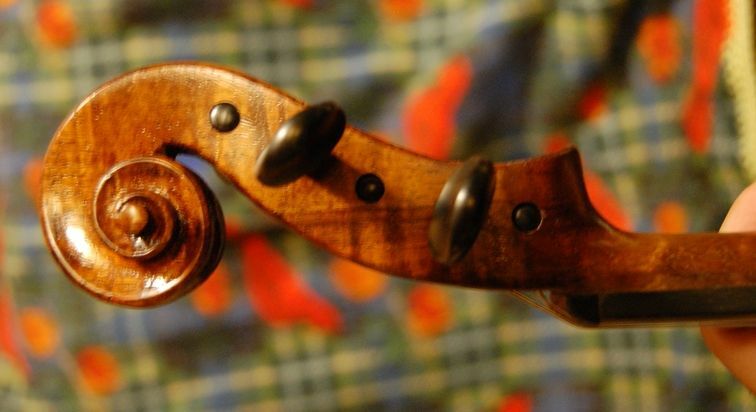 When we last looked at the fiddle, the fingerboard had been permanently glued in place, but it had not been planed to the proper curvature, either logitudinally, or tranversely. I want the completed fingerboard to have just enough “scoop” longitudinally, that there is nearly a string’s width of clearance under the center of the largest string. This seems to help prevent buzzes, among other things, and helps with intonation, I think. The transverse curve is set at a 42 mm radius. I have a steel template I made of scraper stock that is flat on one side, and has the 42 mm curve on the other. I primarily use it to check the curve, but I can also use it to scrape, and sometimes I do so. All the board-dressing has to be done with the nut removed, obviously. It is smart to mask off the scroll with something, too– tape rags over it, maybe, to prevent hitting it with the plane. I began with the small “hammer-handle” curved-sole plane, reducing the surface in the center of the board; then a very small, cheap stanley plane, razor-sharp and adjusted for a fine cut. I checked every few minutes to see how the curve was developing. When it began to look reasonable, I switched to a scraper, working diagonally across the board, to get rid of the plane marks. Then I switched to a coarse Swiss file, held flat on the board, and working up and down the board until all the “dull-spots” had begun to be shiny. I check the curve again when it is all smooth, then switch to abrasives, using a hard plastic block that looks like teflon, but is some sort of high-density plastic they use at work sometimes. This was a scrap, and it works well for a sanding block, though a hard wooden block would be fine. It is about 3″ long, 1-1/2″ wide, and 1″ thick. I started with about 100 grit, then almost immediately switched to 400 grit, then to 600 and finally 1500 grit. With each change, I worked up and down the board until all the board had the same look. After the 1500-grit work the board was very shiny, and exactly the right curvature in both directions. The nut ultimately has to support the upper ends of the strings, just a scootch above the surface of the fingerboard: about the thickness of a good business card is ideal. bear in mind that every “non-open” note is actually touching the fingerboard, so the closer you can get to the board without touching it, the better. This does require that the fingerboard be perfectly dressed, without even the slightest humps or hollows, otherwise it will buzz. I had already shaped the nut so that it was about a millimeter taller than the end of the fingerboard, exactly the width between the end of the fingerboard and the beginning of the pegbox cavity, and curved to perfectly match the top of the fingerboard. Also, the top of the nut has to “roll off” into the pegbox smoothly, so that there is no sharp break in the curve as the strings go over the nut toward the pegs. We are trying to avoid any unnecessary stress risers in the strings. While the glue on the nut was drying, I fit the soundpost. I want the completed soundpost to start out about one post width behind the treble foot on the bridge, and pretty much centered on that foot, laterally. In addition, I want it vertical: parallel with the vertical edges of the end and corner blocks. so I remove the end-pin, shove my bi-focals as close to the hole as possible, and, using a bright light source, I maneuver the soundpost into the position I want it. Too tight is better than too loose, as I can keep trimming until the fit is perfect. I can’t put wood back, though, so if I make it too short, the game is over and I have to begin again. (I have done that many times. This takes practice, believe it or not.) A perfectly fitted soundpost is airtight on both ends, just tight enough that it will not fall over when you change the strings, and in exactly the right spot. I will share how I adjust it, though there are undoubtedly as many opinions about that as there are luthiers, so I expect many will disagree. The adjustment has to come after the strings are tuned. By this time, the nut was dry enough I could handle it without fear of knocking it loose, so I could drill the string-holes in the tuning pegs. I used a 1/16″ bit, in an “egg-beater” style hand-cranked drill, to pierce the pegs. Knowing that the pegs will work their way deeper, over time, as they are used, I have deliberately cut the pegs just a tad short, so that as they work deeper, they will not stick out the other side of the pegbox too far. With that in mind, I also place my string-holes slightly toward the fat end of the peg, inside the box, so that it will not eventually disappear into the other cheek of the pegbox. I mark the locations with the tip of my small knife, and drill them out, avoiding going through into the pegbox back. What I did this time was to drill part way, and then remove the peg, and complete the hole with the peg held freehand. A lot of luthiers make a drilling jig, that emulates the pegbox, and holds the pegs firmly, and is much more accessible while offering no danger to the fiddle. (I keep telling myself I need to make one of those…one of these days I will get around to it.) After drilling the holes, I dress the ends of the holes with a round file, so they offer less stress to the strings where they pass through the holes. At this point I felt confident that the glue had set on the nut, so I carefully measured and scribed the string grooves in the nut. Then I filed each groove, using an appropriately sized file. As I said before, I use the little tip-cleaning files available in welding shops. You have to make sure you are actually getting the file-type cleaners…the new ones are just twisted wire. I cut each groove down until it seems the right height above the surface of the board, but I know it will require some fine-tuning once the strings are actually installed. I extend each groove over the curve, and aiming the direction I want the strings to go. I slope the outside two strings inward a little to keep the strings from rubbing on the inside of the pegbox cheek. I also file and scrape both ends of the nut, to fair them into the sides of the upper end of the fingerboard, then polish the sides until the joint is very smooth. I polished the saddle and the end-pin, until the ebony glowed like jewelry. I realize it will get dull later, but for now it looks great. I no longer use sandpaper in cutting a bridge. I have finally gotten good enough at spotting what needs to be trimmed that I can achieve full fit without resorting to abrasives or even chalk-fitting. This is a job for a sharp knife, and a “calibrated eyeball”. I begin by setting the bridge blank (I used a Milo Stamm bridge blank this time) on the belly of the violin, centered between the inner nicks of the f-holes. I position the bridge with the branded side toward the tailpiece (away from the fingerboard). I tip the bridge toward the tail-block just enough to make the “south side” of the bridge perpendicular to the belly (at that point). Then I usually slide a sharp pencil along the base of the feet on the south side, to establish the curvature of the belly on the feet, so I know where to begin. When I am done, I want the back side (tail-piece side–south side) of the bridge to be perpendicular to the belly, and the feet to have achieved an “air-tight” fit in their respective spots. When I have managed that starting point, I can begin carving away all “excess wood” on the upper part of the bridge. I carve using a very sharp, fairly large knife, to get the feet fitted to the top. To complete the fit, I sometimes switch to a very sharp, slightly curved scraper. Once the feet fit perfectly, I hold the bridge firmly in place, with one hand, and slide a pencil along on the fingerboard with the other hand, with the pencil projecting out far enough to scribe the curve onto the bridge. That line will not be correct, but it gives me a place to start. I usually raise up the center of the curve about 3 mm; the bass side about 2.5 mm; and the treble side 1 mm. I fair in the curve across the top, so that it is similar to the fingerboard but more sharply curved. I trim the top down to that new line, or just above it a millimeter or so, and establish the string positions, making small notches for each string, in exactly the right location, but knowing that the height will be wrong. I then set the height using the strings. I install the tailpiece and all the strings, spacing them out across the bridge, in their respective slots, and measure the height of each string. I want about 5 to 5.5 mm on the C string, about 5.5 to perhaps 6 at most, on the G string, the same on the D, , a litle lower on the A, and about 3 to 3.5 mm on the E string. I check, calculate about how much to take off on each string, if any, then usee a string jack to raise the strings so I can remove the bridge. The string jack will also maintain tension while I work on the bridge, so I can just slip it back in and check the height as I work. When the string heights are right, I complete the trimming of the bridge, removing all excess wood. I open the “kidneys” and “heart” somewhat, lower the knees, thin the bridge from front to back, so that the upper edge is about 1 mm to 1.5 mm thick. I thin the feet so they are about 1 mm thick at the toes, and thin the ankles appropriately, as well. I don’t like the look of a fresh-cut bridge, so I rub that fresh-white bridge on the back of my head, where there is enough oily scalp under the hair, to take off the white, and leave a thin oily film that looks a little more subdued. At that point I tune the violin, and check the height of the strings at the nut. I loosen one string at a time, and file the grooves until the strings come very close to the fingerboard, then re-tune. This time I got lucky, and arrived at the correct adjustment on the first attempt, but usually I have to take the strings back off, and adjust the tailpiece. What I am after is to get the ratio of the vibrating string length to the “afterlength” between the bridge and the tailpiece to exactly a 6:1 ratio. In this case, the vibrating string length was exactly 330 mm, and the afterlength (measured from the contact point the bridge to the contact point on the tailpiece) was exactly 55 mm. Couldn’t be better! There are many types of chinrests, made of many different substances. 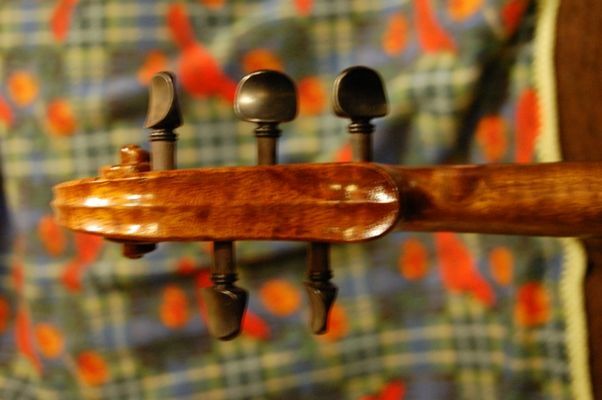 I have made them from scratch, and have bought ebony, boxwood, Rosewood, and bakelite chinrests. People have different tastes and needs (Allergies are a problem for some people, using some substances…Cocobolo is a bad one for some people; Rosewood for others.) I used bakelite, this time, on the theory that it is light, and will not dampen the vibration of the instrument very much. Besides, I have never heard of anyone having an allergic reaction to bakelite. But fittings are pretty easy to make, and if someone wanted a curly maple chinrest, or whatever, I would certainly make it for them. I adjust the soundpost to try to get the best balance from string to string, and the best quality of sound I can coax out of the violin. I begin by tuning very carefully, then I play the G note on the C string, for instance, and alternate between the open G and the G note on the C-string, listening to the quality of sound, and the relative volume, brightness, etc. If one is significantly weaker (say, the C-string is weaker than the G), then I fudge the soundpost very slightly toward the weak-sounding string. Usually just a tiny move is sufficient. once I have adjusted so that the balance is fair across all five strings, if I want it brighter as a whole, I can move the soundpost slightly north, etc. I still want it close to vertical, and still have to have that “air-tight fit”. Over the next week, I will play it a lot, and keep checking the sound, the balance, etc. This seems to have about the strongest C-string of all the five-string fiddles I have made. I don’t know if it is due to the Koa wood, or the special arching I experimented with this time. I really hope it is the arching, as I probably can repeat that, but may never get to work with Koa again. The only way to find out is to make another fiddle of some other wood, and duplicate the arching. The balance is good across all five strings,and quite strong…definitely on the bright side. I expect that the hard heavy Koa wood, in thin graduations, affected that aspect of the sound. The sound is clear, even in higher positions on the bass strings. My anticipation is that, as it plays-in, the sound will open up a good deal more, and mellow somewhat.